Among the visitors at Marine Travelift during Manufacturing Day on Oct. 27 was Morgan Huehnerfuss. 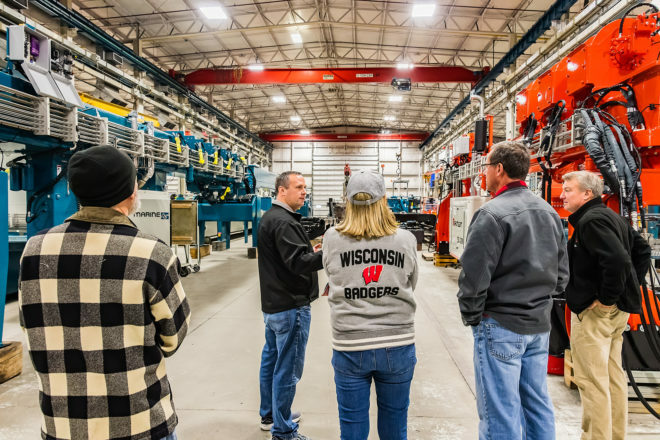 Unlike most others taking advantage of the tours to learn about the industrial and manufacturing work being done in Sturgeon Bay, as an employee of ExacTech, one of the dozen businesses that opened doors to the public for Manufacturing Day, Huehnerfuss is well aware of the good work done in Sturgeon Bay’s industrial park. He had driven from Green Bay that morning with his girlfriend, Kahri Hajos, because he is proud of his work. Huehnerfuss is originally from Shawano. He was hired by ExacTech 2½ years ago, right out of NWTC. ExacTech fabricates the parts for the marine and industrial cranes and forklifts that Marine Travelift builds for customers around the globe. Jim Schuessler, executive director of the Door County Economic Development Corp., said that is exactly the point of Manufacturing Day. Two days before Manufacturing Day, students from area schools toured the manufacturing businesses at the industrial park and Fincantieri Bay Shipbuilding. Schuessler also convened a press conference with Green Bay media in order to get the word out that Door County is open for business. He said Marine Travelift is looking for assemblers and an engineer while sister company ExacTech needs welders. He said starting wages in assembly are $16 to $17 an hour, while welders start at $20. “It goes up based on what they can do,” Olsen said. After hearing reports from the 12 companies that interviews continue to be conducted as a result of Manufacturing Day, Schuessler said the strategy worked. Schuessler said he would like to hold similar events for other sectors of Door County’s economy. “We have to find a way to support hospitality,” he said as an example.